The Belle Rive Northeast Edmonton home sale price per square foot has dropped to $243 in October, that is off the high of $266 in 2013 which was last quarter. 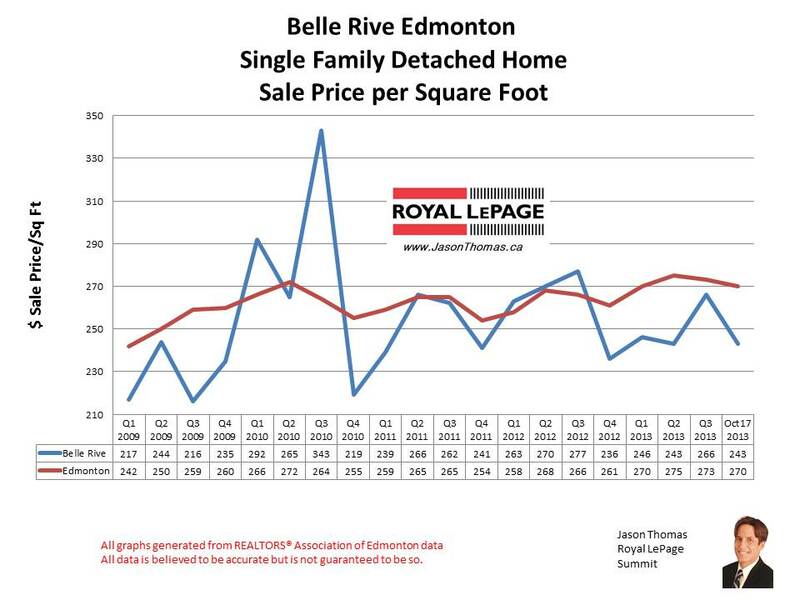 The Belle Rive area tends to sell just at or below the Edmonton average selling price per square foot, so Belle Rive will likely move higher as we finish 2013. The highest sale price for a house in Belle Rive in 2013 has been $765,000. The average selling price for a single family detached home in Belle Rive so far this year is $422,882. The average time it is taking to sell a house in Belle Rive over the previous 90 days has been 53 days. A little slower than the Edmonton average days on market of 44 for the same time period.